There are various websites with high quality, systematically organized information about California native plants, including Calflora, UC Jepson Herbarium, CalPhotos, USDA PLANTS, FEIS, nurseries such as Las Pilitas and Mostly Natives, and many more. From the point of view of CNPLX, all of these websites are reference sites. The idea of the project is to index a collection of reference sites by species. When a user is looking at the detail page for a particular species, they will see links to all of the references sites that pertain to that species. Acknowledgments. This project would not be possible without Calflora. First of all, Calflora did a massive amout of work to compile the list of species and associated information. Secondly, Calflora has chosen to make that work available to the public, providing the best possible example of an electronic library. This project is also dependent upon the many other individuals and institutions who have prepared information about native plants and made that information publically available on the web. Louise Lacey (see Growing Native) has contributed both valuable advice and a long list of native nurseries. sites with horticultural information about species. Thus, each reference site is categorized into one of three possible subject areas: the two above (Availability, Horticulture), and a third catch-all (Other). In addition, some reference sites have a brief comment about the content. For a nursery site, it might be wholesale or seeds (meaning they only sell seeds). For a horticulture site it might be butterfiles (meaning the webpage concerns the relationship of butterflies and native plants). Source Data. This site is driven by a collection of XML files that specify which websites have information about which species. Most of these files were produced by scanning documents on the web that mention various native species. For nurseries without a website, the files were produced manually (by making a checklist in CNPLX and saving it). Nursery availability infomation is recent, but not critically up to date (i.e. call the nursery to make sure they have your plant!). The set of XML files is publically available: point your browser at the http://www.cnplx.info/nplx/NLX directory and you will see them. You are welcome to use them for any non-commercial purpose. The collection is growing as additional web resources are discovered or developed. Calflora. This site relies on the Calflora species database as a list of California native plants, and for supplementary information about each species. There is more information about the Calflora species database here: About the Calflora Species Database and here: Calflora Species Database Fields Descriptions. The list of counties provided on the species detail page is based on an interpretation of Calflora occurrence data -- it differs from Calflora in that it does not include a species in a county if the only evidence is literature. It may still be overly broad in many cases. See the Calflora species page for more infomation about county-level distribution. URLs. Almost all pages on the site are reachable by URL, which means that it is possible to bookmark or email the exact page you are looking at, and return to it (or send someone else to it) later. Much of the data presented on CNPLX is courtesy of Calflora. If you find CNPLX to be useful, please consider making a contribution to Calflora. For comments and questions about this site, please contact John Malpas. 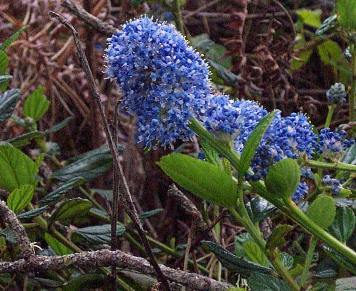 Ceanothus thyrsiflorus in Jughandle State Reserve, Mendocino Co.